The night kicked off with a spectacular performance from Johnny Gallagher, as the lights began to rise with searing blues rhythms, melodies and an amazing use of a loop pedal. He made the X20 sing, even the breaking of a string couldn’t put him off, and the audience didn’t notice until he pointed it out. 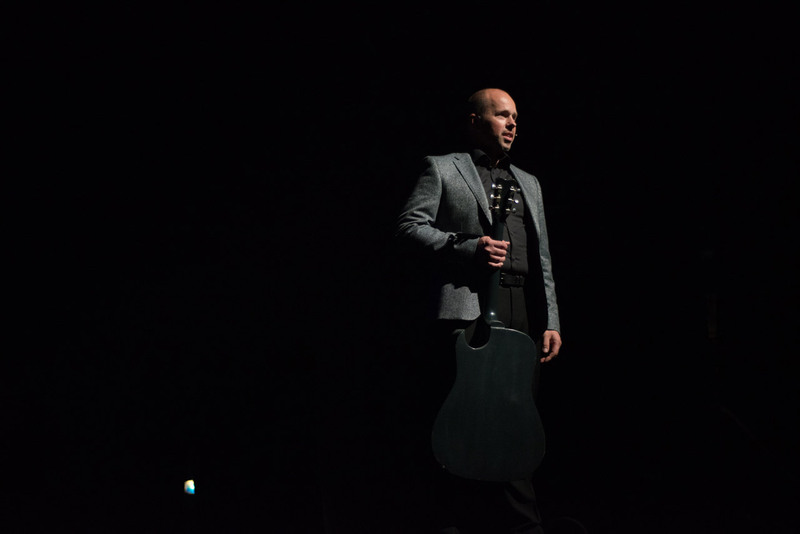 After Johnny’s performance, Alistair came to the stage to tell a little of his Emerald story, from building racing boats to creating his very first guitar, which he then produced on stage. An exercise of passion, and an excellent first attempt, it inspired him to try again, and again, and again. 20 years later Alistair has produced an extraordinary range of guitars which, as John Muldowney puts it, gives us an insight into the mind of the‘mad genius’ Alistair Hay. Alistair then revealed his latest creations: The new X7, X10 and X30. The X7 is a parlour sized guitar and has been designed to offer maximum tonal output in a compact ergonomic package. The newly redesigned X7 features an extended access cutaway design that eliminates the heel and gives thumb access up the back of the neck for the full extent of the generous cutaway. Whether you are looking for a parlour guitar for playing at home or on stage or a compact guitar for road tough travel the X7 will prove an excellent choice. Precision, Playability, power and presence, thats what defines the X10. The body has been sculpted with an ergonomic design for comfort and playability with a slim fast neck and an extended access cutaway to give unrivalled access right up to the 24th fret. Acoustically the X10 offers the great tone Emerald guitars are known for but its when you plug it in that it really takes it to a new level of versatility. John Muldowney, Rhys McBride and Simon McCafferty then performed some beautiful pieces on the new members of the Emerald Family, with their own arrangements on some classic songs, including Johnny B Goode. The rest of the night we were privileged to hear some fantastic local musicians perform, including Mark Black, who played an Emerald Chimaera, a double necked-acoustic guitar. Of course, 18 strings weren’t enough for Mark so he played a didgeridoo and a kick pedal too! A fantastic performance that demonstrated the creativity that the Emerald guitars are created for. Without Willow, played an atmospheric mini-set of songs with their full band, kicking it off with‘Leave The Way You Came’. They were closely followed by Cian & Trudy who demonstrated some beautiful traditional Irish pieces, and extraordinary musicianship. They had the audience bouncing and clapping along, really capturing the party mood of the room and the night. Tony Bernard, a world-renowned Harp and Jazz guitarist joined us all the way from Sydney via London. He provided us with two stunning performance on the Synergy Super Treble, including his version of the Disney classic‘When you wish upon a star’. Tony was then followed by two well-known musical brothers from Donegal, John and Pat Muldowney. John is the organiser of the Swell Festival, a music festival held on Arranmore Island every year. As Alistair introduced the duo, he announced that all proceeds from ticket sales from the Art of Guitar event would go to the running of the swell festival. They then began to play the first song‘She left without saying goodbye’ a fantastic song with beautiful harmonies. After the earlier reveal of the X7, X10 and X30 people weren’t expecting any other new models but then Alistair announced a secret that was hidden in plain sight. A spotlight lit up an Archtop guitar that had been sitting on the stage all along. Alistair explained his love for arch top guitars and that this was an early preview of a model that is very soon going to get an official announcement. Joseph Leighton, a young jazz musician from Derry, then played a dazzling piece on the Archtop guitar, in it’s first ever performance. Joseph was then joined on stage by Tony Barnard with a second arch top, and together they played an incredible jazz improv piece. Johnny Gallagher then closed the show with ‘coming to my hometown’, played on the Amicus, which had the audience bouncing, singing and cheering along. As Alistair thought the evening was over, there was one more surprise in store. The lights dimmed and a video flashed up on screen, it was a message from none other than Alistair’s musical hero, Steve Vai! Steve Vai and infamous guitar tech Thomas Nordegg spoke of their admiration of Alistair and his guitars, sending their congratulations on 20 years of Emerald Guitars. The show ended with Kim, Alistair’s wife, presenting him with the very first guitar he had ever bought(which he had sold!). 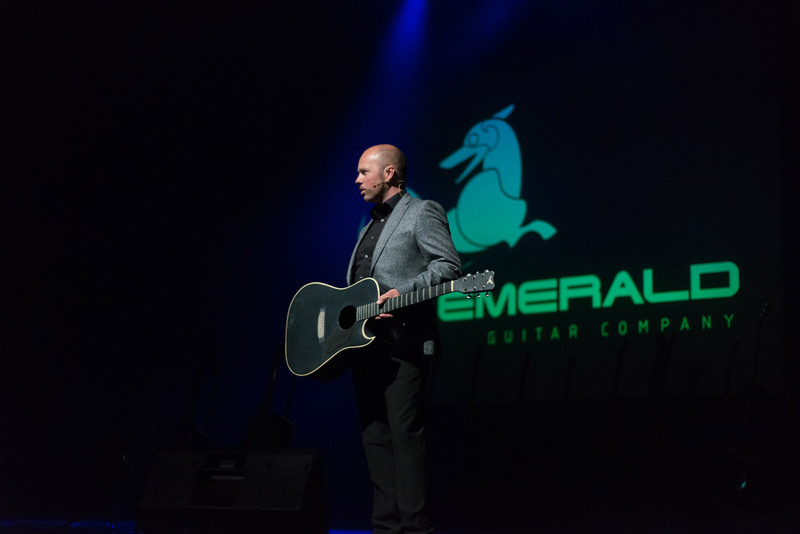 It was a nostalgic, wonderful moment as we looked at the journey over the last 20 years, which was punctuated by the excitement for the future, with the launch of the next season for Emerald Guitars.